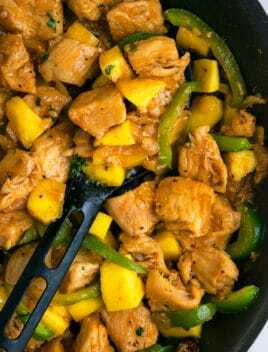 Healthy, quick and easy mango chicken recipe, made with simple ingredients on stovetop in 30 minutes. This one pot meal is loaded with fresh mangoes and sticky Asian sweet and sour sauce. Today’s recipe continues to show off my passion for incorporating fruit into main dishes. This one has a tropical flavor that fuses with Thai/ Asian/ Chinese cuisine. 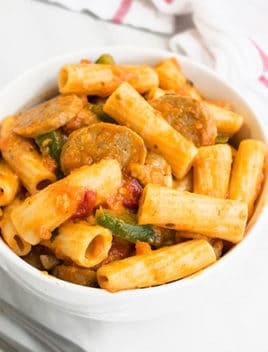 My family likes this even more than Crockpot Orange Chicken and Crockpot Pineapple Chicken. How to make easy mango chicken sauce? Add garlic, ginger, onion, broth, honey, soy sauce, red chili flakes, mangoes. When you are ready to make dinner, mix this sauce with stir fried chicken and vegetables. What sides to serve with Chinese chicken recipe? Rice- You can just serve boiled/steamed jasmine rice or basmati rice or try this Pineapple Rice (One Pot) or even Cauliflower Fried Rice (One Pot) for a healthier alternative. Roasted vegetables are always a classic side dish. Here are some of my family’s favorites: Oven Roasted Carrots (One Pan), Oven Roasted Asparagus (One Pan). 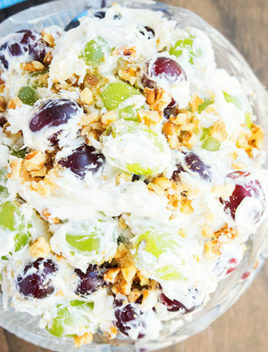 Salad– Keep it simple. A green salad is an awesome choice. Spaghetti squash– Making it in the instant pot is so quick and a great low carb choice. 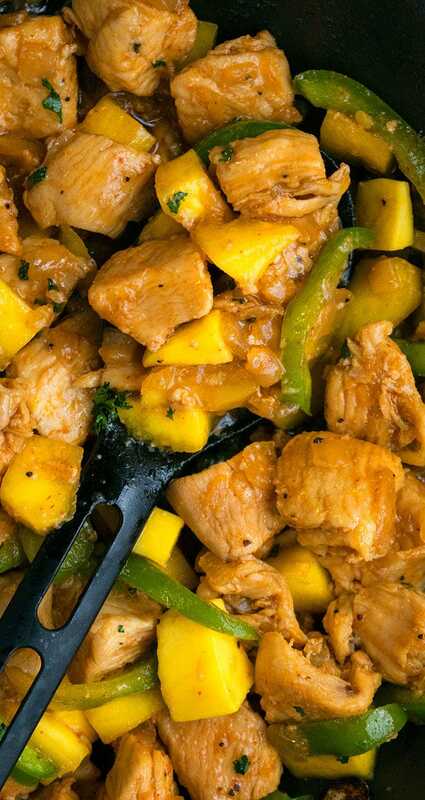 Baked mango chicken– Mix together all the ingredients (except cornstarch) in a large bowl. Marinate for at least 1 hour. Bake at 350 degrees for about 25-30 minutes or until chicken is cooked through. I recommend using whole breasts instead of cutting them. Mango salsa chicken– That’s an entirely different recipe in which you stir fry the chicken and mix in with store-bought or homemade mango salsa or you can use mango chutney too. 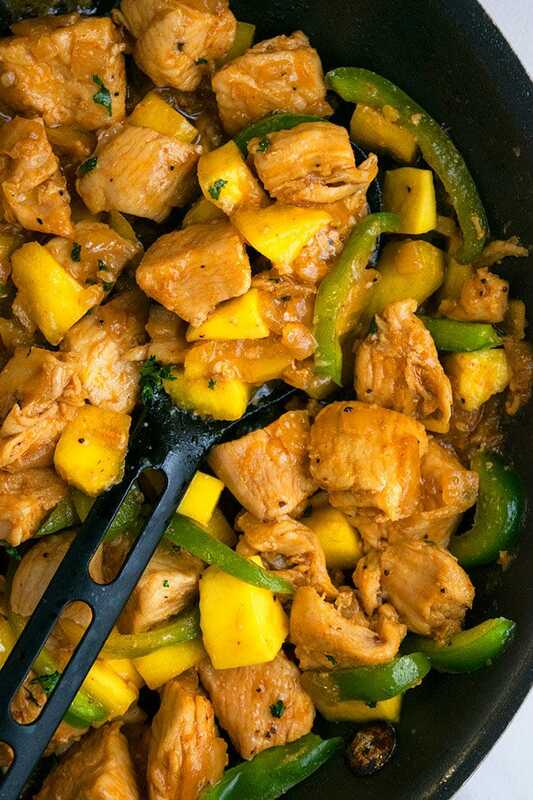 Coconut mango chicken curry– Add 1 cup coconut milk or coconut cream next the end and thin it out into a curry consistency. Adjust the seasonings, accordingly. Also, garnish with some toasted coconut, prior to serving. Mango chicken salad– Make a green salad and mix the prepared chicken into it. This is a great way to use up leftovers from dinner. Use dissolved cornstarch– Because this prevents the sauce from becoming too lumpy. Don’t add more cornstarch than what’s listed below because the sauce will get thicker, as it cools. 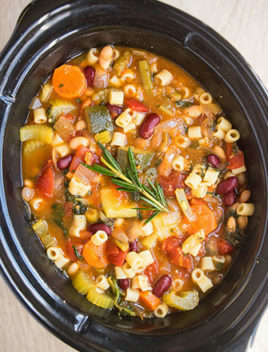 Use low sodium broth and unsalted butter- Because that prevents this meal from becoming too salty. What cut of chicken to use? You can use whole chicken breasts or cut them into 1 inch cubes. You can also use thighs or drumsticks. You can even use wings, which would make a great appetizer! Adjust sweetness- This is a personal preference. Add more or less. Also, I like to use honey but you can use granulated sugar or brown sugar or even maple syrup. Garnish options- Any of these would work well: Finely chopped green onions, cilantro or parsley. 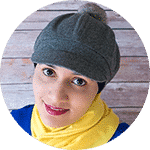 Fresh mangoes vs. Canned mangoes– I highly recommend using fresh mangoes because they taste the best but if you don’t have them, you can use the canned version. Make sure to drain and rinse though. Use both, butter and oil– Using them both together gives the best overall flavor. Serve a crowd– You can easily double or triple this recipe for dinner parties. 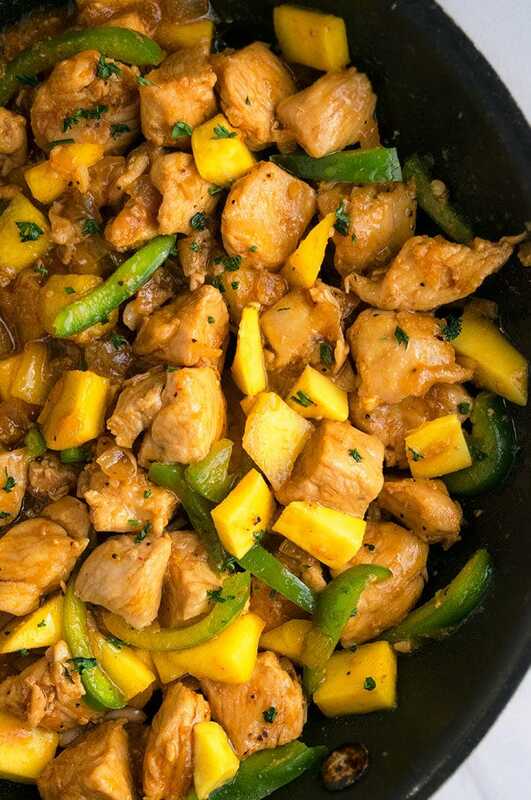 Quick and easy mango chicken recipe, made with simple ingredients in one pot on stovetop in 30 minutes. Loaded with fresh mangoes and Asian sweet and sour sauce. 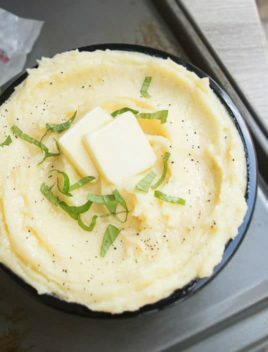 Heat butter and oil in a large nonstick pot or pan over medium high heat. Add chicken and sprinkle salt and pepper. Saute until golden brown. It does not have to be fully cooked. Add onion, garlic and saute for 1-2 minutes until fragrant. Add broth, honey, soy sauce, vinegar, red chili flakes and mix everything together. Add green peppers and half the mangoes and let it all simmer for 1-2 minutes. Pour the dissolved cornstarch and continue cooking, uncovered, until sauce thickens to your desired consistency. Mix in the remaining mangoes and garnish with thinly sliced green onions, if you like. Enjoy!